Ever wondered what would happen if the Creature from the Black Lagoon hooked up with a leading lady (or in this case, a mute cleaning lady)? 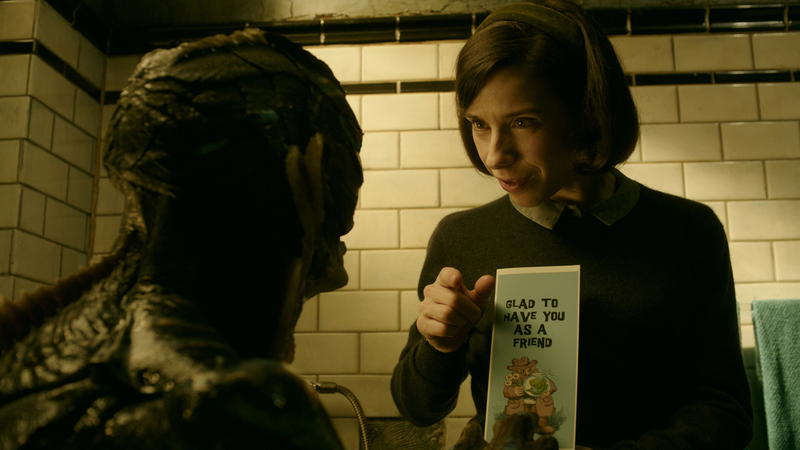 Well, eccentric auteur Guillermo del Toro has it covered with his latest, The Shape of Water, a fantastical B-movie love story set against the backdrop of Cold War era America, at around about 1962. Unlike del Toro’s Spanish-language classics, Pan’s Labyrinth (2006) and The Devil’s Backbone (2001), The Shape of Water is a bit silly, this exaggerated adult fairytale/ dark fable (which features snippets of icky horror) exploring timeworn themes of forbidden passion and the loneliness of being born a little different, del Toro using these motifs to celebrate his love for monsters, mad scientists and all things macabre. Adhering to its fairytale underpinnings, the picture opens in a flooded green-y apartment, a dreamy score by Alexandre Desplat, Argo (2012), setting the scene. This is accompanied by a charismatically soothing voiceover by Richard Jenkins, The Visitor (2007), who refers to ‘the princess without a voice’ and ‘a tale of love and loss.’ Jenkins, of course, is talking about our protagonist, Elisa Esposito (Sally Hawkins), a voiceless orphan who mops floors in a top-secret Baltimore-based laboratory (Occam Aerospace Research Center), where shadowy experiments are conducted to help America win the Space Race against Russia. Working the night shift alongside Elisa is Zelda (Octavia Spencer), a boisterous talker who complains about her deadbeat hubby, Brewster (Martin Roach), and responds to Elisa’s sign language with a torrent of words. Away from work, Elisa resides in a dank, crumbling apartment, which is located above a vintage movie theater called the Orpheum (where Technicolor Bible epics are screened for an empty auditorium) and down the street from a burnt down chocolate factory, this giving off the impression that the whole neighborhood smells of toasted cocoa. Elisa spends a lot of time with her neighbor and our narrator Giles (Richard Jenkins), a repressed, out-of-work gay man who lives with his cats and watches old Hollywood musicals on his black-and-white TV, the twosome often visiting an all-American diner so that Giles can flirt hopelessly with the young waiter (Morgan Kelly) who serves him. 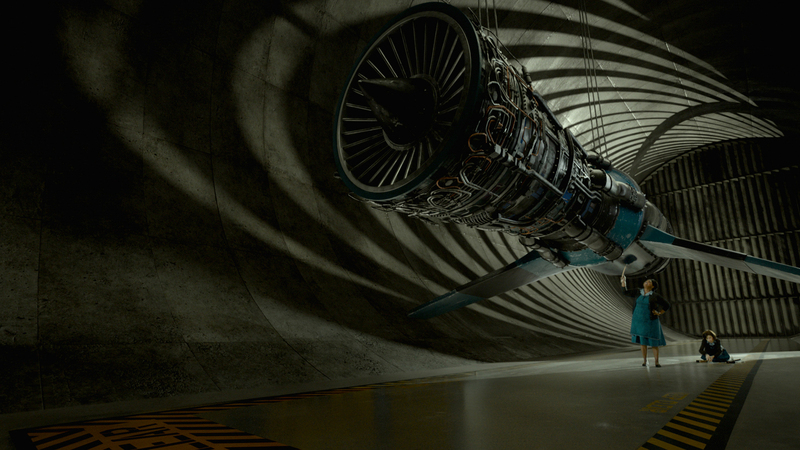 On one of their shifts, Elisa and Zelda find themselves scrubbing blood off the floor of a concrete-clad lab. Turns out that the company’s tough, sadistic head of security, Richard Strickland (Michael Shannon), lost a couple of fingers while wheeling a portable pressurized water tank into the facility. Tending to the workshop that houses the tank, Elisa takes a peak at what’s inside during one of her rounds. Imprisoned within the chamber she sees a mysterious amphibian creature (played under layers of makeup by Doug Jones) that’s dubbed the ‘Asset,’ the fish-man worshiped as a god where he was captured deep in the jungles of South America. Mistreated as a young stray, Elisa makes an attempt to befriend the beast, whom she sees as somewhat of a kindred spirit, both having suffered at the hands of abusers. Offering boiled eggs to eat and classical music to listen to, which eases the monster’s temperament after long days of being tortured by an angry Strickland (who strikes the Asset with a cattle prod), the pair begin to bond, communicating via sign language. Forming a romantic type of connection, Elisa decides to hatch a plan to free her scaly friend from captivity before he’s killed and torn apart by a paranoid government who seeks to exploit the aquatic humanoid, Strickland’s boss, General Hoyt (Nick Searcy), aiming to vivisect the reptilian-man and use its body to help give the U.S. an edge over the Russians. First and foremost, The Shape of Water looks sublime, production designer Paul D. Austerberry, 30 Days of Night (2007), creating a multitude of rich late-50s environments. The emerald-tinted lab, for instance, gives off an unsettling steampunk mood, whereas Elisa’s ‘all about water,’ her abode colored in blues and packed with curvy furniture; Giles’ home contrasts this with warm mustardy colors. Furthermore, cinematographer Dan Laustsen, Crimson Peak (2015), enhances the retro backdrop by lighting the flick as if it’s been shot in a wet, soggy, sub-aquatic world, the prominent colour of green said to be the shade of the future/ or of the man of tomorrow multiple times throughout the narrative. On the flipside, the design of the Asset is a little disappointing, this beastie paling in comparison to del Toro’s other oddities, the gill-guy coming across like a cheap knock-off Abe Sapien from the Hellboy films. Sigh. 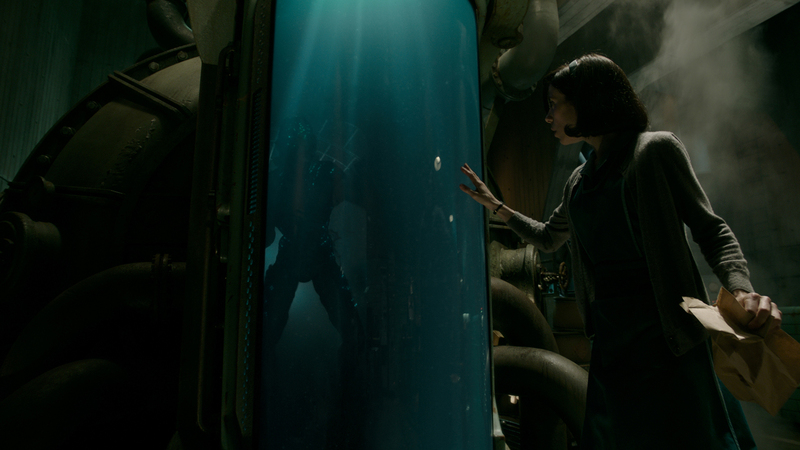 Performance-wise, The Shape of Water is actually quite good. 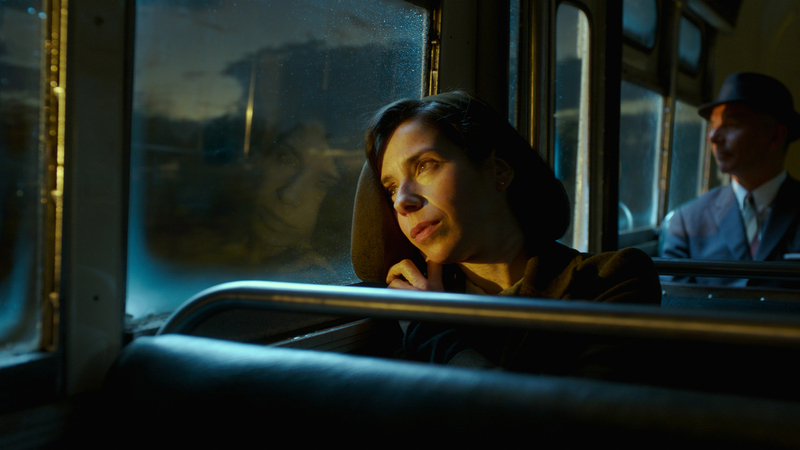 Lead Sally Hawkins, Happy-Go-Lucky (2008), makes the most of her expressive face as Elisa, a lonely serial masturbator who ‘does it’ in the bathtub as part of her morning routine, the talented English actress painting a tender portrait of a vulnerably emotional woman that’s reaching out for companionship — it’s a shame that her bond with the Asset, however, never really feels authentic. The standout, though, is definitely Richard Jenkins, who portrays Giles, a closeted gay illustrator who can’t seem to find an outlet to express his art or oppressed desires. Michael Shannon, Take Shelter (2011), is okay as the sickly sinister Strickland, a generic mustache-twirling bad guy that chomps down on lime-colored candy and prides himself by buying objects that make him feel powerful, Strickland purchasing a teal Cadillac after a salesman assures him that it’s what the ‘man of the future’ will be driving. Octavia Spencer, Hidden Figures (2016), seems to be going through the motions as Elisa’s black bud Zelda (why’s she nominated for an Oscar exactly? ), while Stargate: Atlantis (2004-09) star David Hewlett is forgettable as Occam’s cleaning supervisor, Fleming. Lastly, Michael Stuhlbarg, Call Me by Your Name (2017) — who’s proven that he can make even the smallest support player memorable — is great as a Soviet spy who’s secretly working as a researcher for Strickland and goes by the alias of Dr. Robert Hoffstetler, Stuhlbarg’s sensitive scientist aiding our heroes in breaking the ‘creature from the deep’ out of its clandestine holding cell. I’m in love with the shape of you! 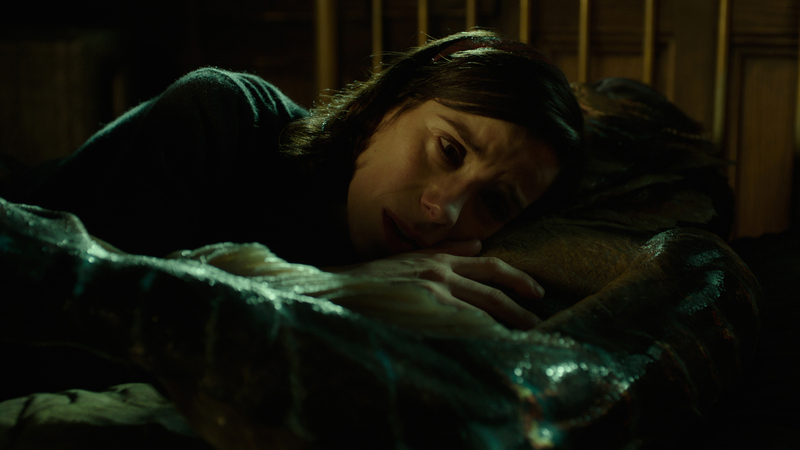 Far from del Toro’s best, The Shape of Water is a bit of a mixed bag, the film’s predictable narrative, which requires audiences to suspend a fair amount of disbelief, ultimately leaving me a little cold. While certain elements deserve the utmost praise (its splashy splendor, in particular), others fail to work — yep, I’m talkin’ about that weird monochrome fantasy dance number that takes place between Elisa and the Asset (a clear tribute to the golden days of Ginger Rogers and Fred Astaire, no doubt). But look, when all is said and done, I’m happy to see the tubby Mexican finally get some praise (and maybe a couple of shinny statuettes) for his tremendous efforts; I just wish it were for one of his better movies.